From geothermal features to crystal clear springs and from Real Middle Earth to caves filled with glow worms, our trip from Rotorua to Waitomo had it all! After the big let down of our Tongariro Crossing being cancelled, we continued on through Rotorua. As an area known for geothermal activity, we wanted to see as much as we could in our short time there. We had an action packed day planned filled with lakes, geysers, and springs, and we planned on finishing it off at Hobbiton, the famous set from the Lord of The Rings/ Hobbit series. The highlight of the next day would be an adventurous glow worm tour. We should have known just by the amount of things we had planned that some things would go awry. They tend to do so. Our trip from Rotorua to Waitomo was beautiful, but filled with surprises along the way! Read about Yellowstone Must-Sees and Misses! To read more about the glow worm caves check out my post of 5 Amazing Places: New Zealand North Island! We started our day off early, arriving at Wai-O-Tapu Thermal Wonderland as the gates were opening in order to beat the crowds. We got the quiet park we were hoping for, but the thermal features were lacking. Let me explain- we have been spoiled in that we live within a drivable distance of Yellowstone National Park. The Old Faithful Geyser and the various pools, coupled along with the wildlife in the park and the strange unique features such as Mammoth Hot Springs, make it hard to beat. Walking around Wai-O-Tapu Geothermal Park just did not feel as grand. The pools were shallower, the waters were a duller color, and when we arrived at the highlight- The Champagne Pool- it was covered in steam and you could not see any of the vibrant green blue of the center or the bright orange rim. My frustration at the park was mounting. I started to walk mindlessly past the features waiting to complete the loop and be done with it. We were just about finished when I almost walked right past it- a radioactive green looking pool. The Devil’s Bath, as it is affectionately known, is probably the most unique body of water in nature. The still pool looks like a science experiment gone wrong, given its unique colors by sulphur deposits. I’ve heard many times that patience is a virtue, and this is a perfect example. I was getting so discouraged by what I wasn’t seeing that I got impatient with the park as a whole. I am so happy that the pool caught my eye, because it would have been a shame to miss it! Even if something is not going as well as you had hoped, hold out hope. You never know when there’s going to be something better than you imagined waiting around the next corner! From the Geothermal Park we drove to a separate location to view the eruption of Lady Knox Geyser, which happens every day at 10:15 AM. The whole thing wasn’t terribly exciting, with the staff inducing an eruption. We couldn’t see it well anyways with the amount of people crowding around. Our next stop was an impromptu visit to some lakes in the area. Lake Tikitapu and Lake Rotokakahi (also known as Blue and Green Lakes) sit side by side, and are known for their differing colors. We ate a gourmet camper van picnic of cups of noodles by Blue Lake. After lunch and a quick passing storm, we drove up to an overlook of Green Lake, a completely still lake that is sacred to the Maori people. By the time we left the lakes it was already afternoon, and not even half of our day was done! We headed on to Te Waihou Walkway, which is quite literally located in the middle of nowhere. The signage to the entrance is not clear, but it is worth the hassle of getting there. The walkway travels alongside the Waihou River, following the crystal clear blue water that supplies 60-70% of New Zealand’s bottled water. It is beautiful, but it was clear that we would have a very limited time there. We only got through a small portion of the track. Overestimate the amount of time you will take at each location. We packed the day full with adventure, and were close to missing a scheduled tour that we were looking forward to. We had a lunch with a view, but repaid with our time! Our tour of Hobbiton was the last stop of the day. Although I have to admit I have not seen all of the movies, nor read the books, I was looking forward to some movie magic. The location is magical. The bright green rolling hills provide the perfect backdrop to the many created hobbit holes. The details in the props only further the magic. Not magical? Our tour. I have met many Lord of the Rings fans, and I would go so far as to say the biggest ones I have met have been my parents. They own multiple copies of each book, extended box sets of the movies, and have yearly movie marathons that last entire days. People take these stories seriously. I was hoping this would be the case here. It seemed as if we had ended up on an unlucky tour: we could not hear the guide, the guide did not sound enthusiastic, and everything was rushed. I love the blue door and all the wood featured in this hobbit hole! Halfway through the tour it started to pour. As we backtracked to find umbrellas we became separated from our guide. He was always close, but not close enough we could ever completely catch up without missing everything. Luckily another small group, including a huge LOTR fan, had also become separated. He became our honorary tour guide and we finished the tour together. We enjoyed the second half of the tour so much more. We could hear, our “guide” was excited to tell us cool facts about the movie, and we were not rushing from one location to the next. The tour ended reunited with our group at The Green Dragon, where we watched the sun set as we enjoyed our ale. Not all tours are equal- sometimes you have to improvise! The Party Tree, featured in the first LOTR movie! Facing your fears is always a great idea! We traveled the next morning bright and early to Kiwi Cave Rafting. It was time to finally see the glow worm caves that are unique to New Zealand, and one of the North Island’s main attractions. Instead of doing the most popular tour, which involves a boat ride amongst the caves, we opted for something a little more adventurous.Our tour would involve us rappelling 27 meters down into a cave, black water rafting through the cave to view the glow worms and eels, caving through tight crevices and then rock climbing back up at the end. I was so excited for every single moment of our trip from Rotorua to Waitomo, except for this. I was terrified to complete the rock climb. The fear paralyzed me every time I thought about it. Looking back, it was an irrational fear. I have rock climbed before and survived just fine. But for some reason the thought of a rock climb being the sole way out a cave made me want to cry. The thought preoccupied my mind throughout the tour. I successfully rappelled down, and got to sit in a tube in darkness watching glow worms light up the entire ceiling. I squeezed through small spaces, and watched eels swim around my rainboots. When it came time to rock climb up, I let others go first to avoid it. And guess what? I rock climbed my way successfully up that cave, and made it to the top. I faced my fear, and felt better after doing it. Facing fears, no matter how irrational they may be, can be scary. But in my experience they’re almost always worth it! Our trip from Rotorua to Waitomo flew by in the blink of an eye. These areas are “must-sees” of North Island, New Zealand, but judging by our adventure, they can probably use a bit more time than just two days! We continued on North towards Auckland, where we would spend the next few days exploring Northland to finish up our campervan adventure. Read about our Northland adventures visiting a sand dune lake, swimming with dolphins and catching a beautiful sunset! Sounds like you had a great time! and your photos are beautiful. Thanks! It was a great time filled with beautiful sights along the way! 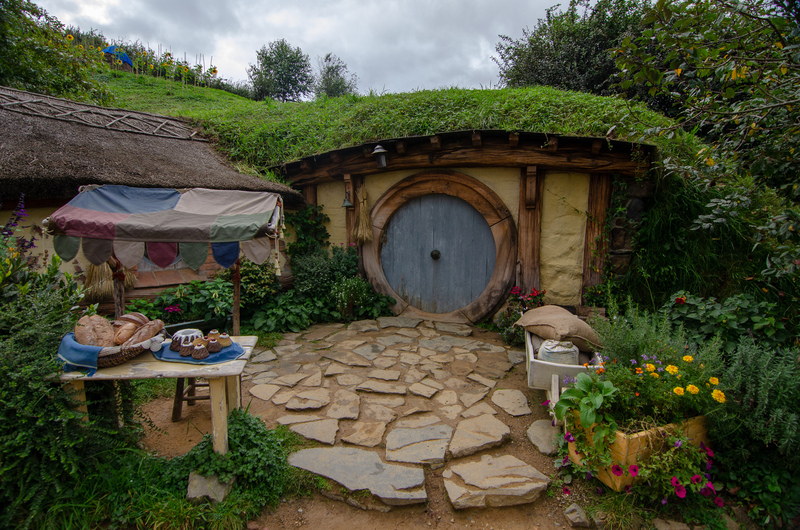 I’m a big LOTR fan so seeing “hobbiton” is definitely on my bucket list! New Zealand looks so beautiful, my parents just took a cruise there and they had the best time! I haven’t heard of anyone cruising around New Zealand, that sounds really cool! I can imagine it’s different to see it from the sea! What a great place – the Hobbit holes and the tree is simply amazing! It sounds like you had a great ‘guide’ to help show you around and telling you about everything. I love reading travel posts – they inspire me so! Thanks for reading, Hobbiton is really a unique place. Even though our guide wasn’t super helpful, we were lucky to have another expert help us out!! Hello fellow PNW’er I have always wanted to visit New Zealand. One day! Yay PNW!!! I hope you make it over there, it’s a longgggg plane ride but well worth the time! What a great adventure! This looks like an amazing place to visit! I love finding spots like this from bloggers. It was a great adventure! I love coming across new places as well, this world is filled with so many amazing places!! I certainly hope that I can visit one day. Incredible photos! Thank you! It’s an amazing area of the world to visit! Thanks for sharing! This really makes me want to go on vacation and try more adventurous things! Thanks for reading! It definitely was a very adventurous trip! Wow what a cool place..I love those hobbit holes…so amazing and who knew there were palms in New Zealand….reminds me of Hawaii- my fav place on earth! Great photos! This is an amazing post – thanks for sharing! Thank you! It was a beautiful location to get some good photos of the nature and the attractions! Great tips and images! Thanks for sharing! Thanks, I love to add tips in so that everyone can get the most out of their experience when they visit! What an amazing trip you had, you did so much! Great photos! It was amazing! It was super filled with things, which was great but we were a bit tired after these few days. Thank you for sharing your tips! 🙂 That’s so cool you stumbled upon the green radioactive looking pool. It reminds me of a cartoon or something you’d see in movies. Congrats too on conquering your fear when you did the 27 meter rappel! The pool was so cool! I have never seen that color in nature, so it was definitely unique. Thanks, I am happy I did it even though it scared me! What an amazing place!!! Loved the post! Thanks for sharing! It was amazing! Thanks for stopping by and commenting! We’re hoping to go to New Zealand soon, I think you’re right about overestimating how much time you need! The Devil’s bath looks amazing! I would definitely overestimate the amount of time wherever you go. We ran into a similar problem when we were in The Coromandel- there were so many places we wanted to stop on the way that we ran out of daylight!!! I loved the trip, there were just aspects about it that didn’t go quite as planned. With the geothermal area, I have truly been spoiled by having been to Yellowstone many times, and it is probably the coolest geothermal area in the world! I am happy to have introduced you to this special part of North Island, NZ! Incredible pictures! New Zealand must have one of the most unique and diverse landscapes on Earth! It definitely is unique, and what is cool is that there are so many different landscapes packed into such a small island. The South Island is completely different as well!